Synopsis: Andrew Neyman (Milles Teller) is an ambitious young jazz drummer, single-minded in his pursuit to rise to the top of the east coast music conservatory. Plagued by the failed writing career of his father, Andrew hungers day and night to become one of the greats. 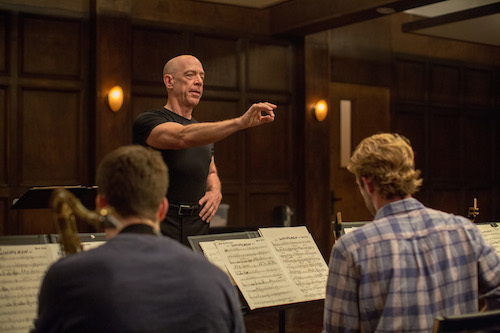 Terence Fletcher (J.K. Simmons), an instructor equally known for his teaching talents as for his terrifying methods, leads the top jazz ensemble in the school. Fletcher discovers Andrew and transfers the aspiring drummer into his band, forever changing the young man’s life. Andrew’s passion to achieve perfection quickly spirals into obsession, as his ruthless teacher continues to push him to the brink of both his ability – and his sanity. At one point in Whiplash, a teacher tells his student that “there are no two words in the English language more harmful than ‘Good Job’.” It’s his way of explaining that security breeds complacency. 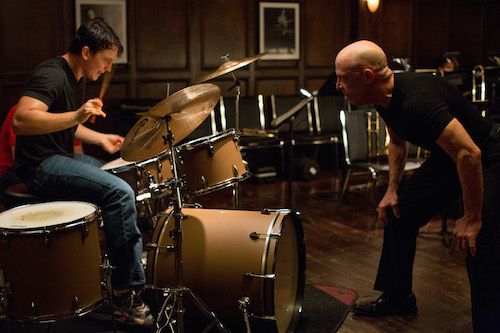 Whiplash explores the hell out of the concept of pushing oneself to be their best. Whiplash is the story of a teenage drummer named Andrew Neiman (Miles Teller from Project X and The Spectacular Now) who is a student at the prestigious Shaffer Conservatory of Music. One morning, Andrew is practicing hard when Terence Fletcher (Contraband‘s J.K. Simmons), a renowned jazz musician and respected conductor, hears him and asks him to play for the school’s studio jazz band. Andrew starts off as an alternate, doing nothing more than turning pages of sheet music for the core drummer, but soon he works his way onto the drum throne. Fletcher pushes Andrew to the limits, both emotionally and musically, playing a game of psychological torture in order to get the best results out of the young drummer. Andrew soon learns that Fletcher doesn’t know when to ease up on the pressure. Written and directed by Damien Chazelle (Grand Piano, The Last Exorcism Part II), Whiplash is based on the filmmaker’s own experiences as a young drummer. As a school band player, Chazelle remembers being so intimidated by his conductor that he was deathly afraid of making a mistake. He channeled that fear into an electric screenplay about the pressures that comes with realizing one’s own potential, and the movie taps into the subconscious fear of teachers that everyone harbors deep down in their repressed memories. Except that Chazelle’s band leader probably never threw a chair at him when he dropped a beat. 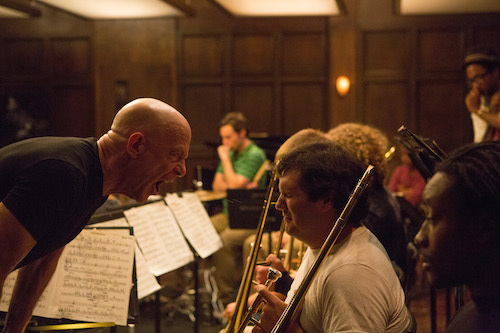 It may sound weird to describe a movie about jazz music as exciting, but Whiplash is a very visceral movie. The way it’s put together is not unlike an action film. The musical performances in the film are high-stress affairs, duels between conductor and drummer that lead the audience down a path to a climactic showdown that is as breathtaking and exhilarating as any gun fight or car chase. In one montage, Andrew practices so ferociously that his hands start bleeding all over the kit until, finally, he ends up putting his fist through the snare drum in a startling fit of frustration. Andrew wants to be the best – the next Buddy Rich – but how much of his blood is he willing to leave on the drums to get there? It’s a fair statement to say that Whiplash is the Full Metal Jacket of jazz. Simmons’ Fletcher is eerily reminiscent of Lee Ermey’s drill sergeant character in Stanley Kubrick’s classic Vietnam War movie. In one scene, as Andrew is having trouble with the tempo on a certain song, Fletcher slaps him across the face, demanding that the boy tell him whether the assault was dragging or rushing, until a single tear rolls down the drummer’s face. In another scene, Fletcher calls out the whole trombone section when one of them plays out of tune, humiliating them all in front of the entire band. Fletcher’s students seem more like they’re in boot camp than a music conservancy, but that’s what Fletcher wants. He intimidates good performances out of them. Whiplash is basically a thriller about band geeks. There are a handful of supporting characters, but Whiplash is mainly about Andrew and Fletcher. Miles Teller and J.K. Simmons carry the movie. For Teller’s part, his performance in Whiplash should make him a star; he plays the overly sensitive-yet-talented teen very well. 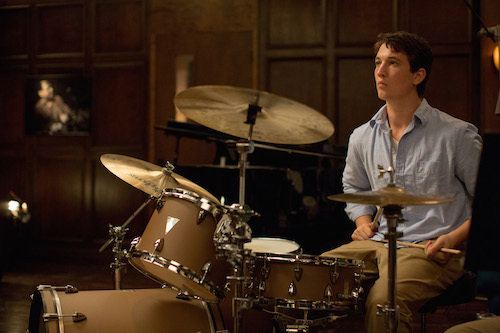 Like Damien Chazelle, Miles Teller has also been a drummer for years, so his musicianship is completely convincing – Chazelle even refused to call cut during Teller’s drumming scenes in order to completely exhaust the guy, and his desperation is apparent in his performance. At the other end of the spectrum is J.K. Simmons, whose Fletcher is a perfect villain to Andrew, hurling verbal insults when he’s not hurling pieces of the drum kit. Fletcher is a combination of every jerk that Simmons has ever played onscreen rolled into one intolerable character; even when he’s being nice, he’s rude and condescending. Teller and Simmons have a hateful-respect type of chemistry about them, and their interplay results in some great cinematic moments. 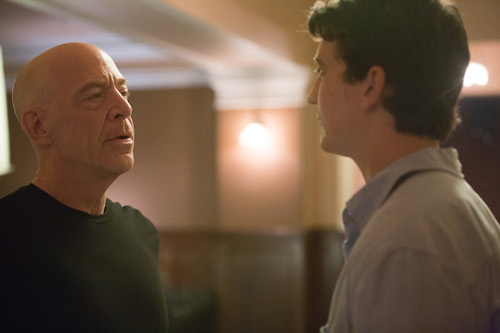 Both actors have a field day with Whiplash. As expected, the music in Whiplash is mostly jazz. The title song, composer/saxophonist Hank Levy’s “Whiplash,” obviously features prominently in the score, as does another standard written by Duke Ellington and Juan Tizol called “Caravan.” The bulk of the rest of the music was composed by Justin Hurwitz (a friend of Chazelle’s who also scored his Guy and Madeline on a Park Bench), and it fits in well with the big-band jazz that forms the backbone of the movie. The musical numbers are energetic, the arrangements are flawless, and the performances make it look easy. In a movie like Whiplash, a quality soundtrack is important. Luckily, the film has one.